Just as Thomas Edison represented the America of his time, so too does he represents the America of our time in his try-and-succeed, try-and-fail methodology. American Experience: Edison portrays Thomas Alva Edison as a conspicuously American archetypal figure in his outsized contradictions. We learn here that he was the very model of the ingenious inventor of world-changing technological wonders, self-taught and practical in contrast to the iconic visionary Albert Einstein (whose theories Edison professed not to understand one lick). Although his contraptions were revolutionary products of patient experimentation and tireless collaboration, Edison was a grandiose self-promoter who turned himself into a walking brand. Widely admired and hugely famous from relatively early in his career, Edison worked restlessly, reacted vehemently when he felt betrayed by associates, and undertook a ruthlessly negative public relations campaign when competitors bested him with superior methods and innovations. In showing these many aspects of the man, Edison offers a complex image of the inventor of the phonograph (the first device to record and play back sound), the first sustainable light bulb, and the motion picture camera that would one day make this very film (and, consequently, this review) possible. Michelle Ferrari's portrait shows a man possessed of undeniable genius and imagination, as well as tunnel vision and tremendous venality. The program traces Edison's early years as a precocious tinkerer and experimenter, deprived of proper schooling, but insatiable in his autodidactic curiosity. Early work as a telegraph operator gave him detailed practical knowledge of the machine that heralded a new age. Edison raised funds with various telegraphic patents to set up a purpose-built new lab of his own in New Jersey, and applied what he learned to the problem-solving processes whose technological results would make his name, not to mention his fortune. Millions of Americans can tell you what happens next, at least in general terms. But American Experience reframes the familiar narrative of Edison’s incredible string of eureka moments with nuance, contradiction, and vital context. His gargantuan work ethic made his inventions possible, and the film mostly eschews hyperbole and platitudes to demonstrate Edison’s practical creative process as well as how he often refined previous inventions. Still, the long hours in the lab created strain in his family unit; when his first wife died before her 30th birthday, Edison felt sharp pangs of guilt at not being more present in the home. Perhaps the most illuminating point made by Edison is that, despite our experiences with the light bulb and descendants of Edison's phonograph and movie camera, in the immediate aftermath of their invention, he never quite harnessed their potential. Edison and his corporate backers managed to make a pretty penny, but the phonograph and motion picture camera remained mere novelties for quite some time and developed into mass media machines under later stewards. Even electric light, identified so closely with Thomas Edison that he may as well have swapped his head for a bulb, developed gradually into a reputation-sullying debacle for the master inventor, the notorious War of Currents. Edison’s single-minded preference for the costly and inefficient direct current (DC) system that he developed blinded him to the advantages of high-voltage alternative current (AC), backed by George Westinghouse on the basis of the patents of Nikola Tesla (aka "the Hipster Edison"). Edison’s massive smear campaign painted AC as too dangerous for mass distribution, and to prove his point, he electrocuted animals and even humans. Edison’s team is responsible for secretly developing the electric chair for the state of New York, which was charged with AC. AC won out over DC in the end, and Edison lost a stake in his electrical company when it merged with another to form General Electric. 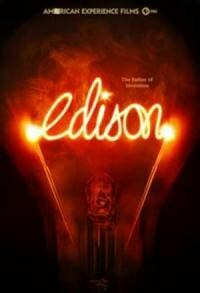 Tesla goes curiously unmentioned in the film; a former Edison Company employee, he quit in disgust after a broken promise of compensation for services rendered. He eventually rose to rival the great man’s electrical distribution achievements, posthumously surpassing them. But then Tesla died poor and unknown, while Edison expired as a national hero. That said, as Edison considers this man so defined by his successes, it also finds something quite revealing in his failures. A substantial section of the documentary focuses on Edison’s grand money-losing misadventure in iron-ore separation mining in Ogdensburg, New Jersey in the 1890s. Although the mine never did become profitable and was eventually abandoned after swallowing a large portion of Edison’s personal fortune, Edison contextualizes the inventor’s involvement in the project as a time of great happiness at practical engagement in technology after many years of public appearances and navigating the business realm. One of the documentary’s interviewees mentions an account of Edison speaking of work with a tone of reverence assumed by the pious when speaking of God. This is the most consistent picture of Edison advanced by the film, as someone more invested in inventing than in controlling consequences. Ogdensburg’s failure reenergized Edison, the program suggests, providing the impetus for the Edison Company’s development of a nascent filmmaking industry. But it also throws the man into sharper relief, so he is not only the Wizard of Menlo Park, but also a driven, self-made man with the characteristic blinders of the future-focused. Edison is made in what you might call the American Experience house style: expositional narration (by series mainstay Michael Murphy); slow pans over archival photos, maps, and technical schematics; and sober, well-spoken talking heads. The formula enables the life story of Edison to migrate towards a rich portrait of an American icon while also commenting on America itself. Innovator, celebrity, capitalist, seeker of the new, Edison was as practical as he was imaginative, as competitive as he was collaborative. And as much as he represented the America of his time, he also represents the America of our time. Splash and thumbnail images courtesy of Thomas Edison National Historical Park.